This short trail offers a pleasant woodland hike along a plunging creek to a pair of small lakes, each set deeply in individual mountain cirques. Climbing moderately through conifer-canopied forest, the trail tracks Talapus Creek to two of its headwater lakes, Talapus and Olallie. The trail is shady but sun-dappled throughout and begins its ascent through young forest that, although logged not long ago, already begins to exhibit the character of more mature forest. Near the lakes, a few old-growth cedars, remnants of the forest past, mingle with the succeeding generation. During the mountain spring, the boglands that fringe each lake nourish moisture-loving wildflowers not often seen in the surrounding woodland and alpine climes. Hermit thrushes (Catharus guttatus) are common to the area — on spring and early summer evenings, listen for their flute-like calls mingling with the voice of chattering creek waters. Given their relative ease of access, both lakes — and especially Talapus — are popular hiking destinations. To avoid the weekend throngs, try timing your hike for a less-congested week day. Near the lakes, snow drifts deeply and lingers late — sometimes, almost until summer. Be sure to check recent trip reports for current conditions before setting out. From a junction along the trail between Talapus and Olallie lakes, a side trail eventually leads to several other alpine lakes, including Island Lake, which births Talapus Creek on a ridge high above Talapus Lake. To visit all three of Talapus Creek’s headwater lakes (Talapus, Olallie, and Island lakes) the round-trip distance is 10.80 miles/17.40 km (although, along the way to Island Lake, you will probably be tempted to follow signage further to the nearby Pratt and Rainbow lakes). Shadowy, relatively young coniferous forest encloses the trail and both lakes. Talapus and Olallie Lakes Trail, July 01, 2017. The cheerful rush of Talapus Creek pattering down its stone-lined path is never far from the zigzagging trail. Talapus and Olallie Lakes Trail, May 30, 2016. On the woodland slopes below the lakes, look for wildflowers scattered amongst the shadows. 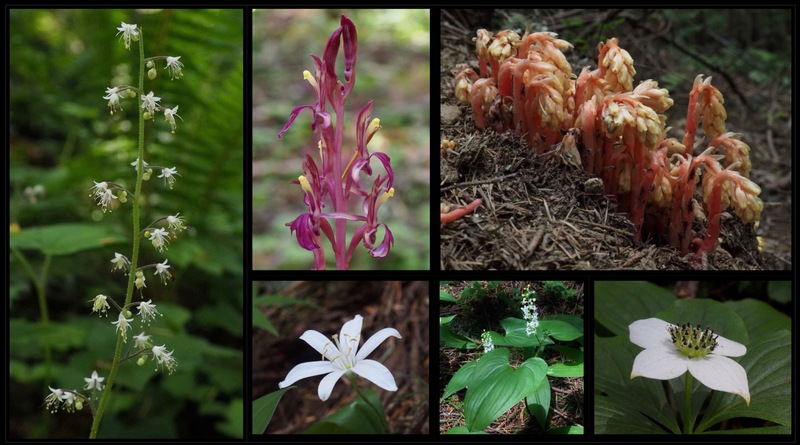 Cut-leaved foamflowers (Tiarella trifoliata) loft constellations of tiny, fringed blooms amid the forest greenery (left); Pacific coralroot orchids (Corallorhiza mertensiana) (upper center) and pinesaps (Monotropa hypopitys, or, Hypopitys monotropa) (upper right) bear fleshy blooms directly from the soil without the aid of leaves or chlorophyll by feeding off of underground fungi; and queen’s cups (Clintonia uniflora) (lower left center), two-leaved false Solomon’s seals (Maianthemum dilatatum) (lower right center), and western bunchberries (Cornus unalaschkensis) (lower right) carpet the forest floor. Talapus and Olallie Lakes Trail, June 22, 2014 and July 01, 2017. Near Talapus Lake, the trail flattens, crisscrossing the Talapus Creek among western redcedars (Thuja plicata) that lap its waters. Talapus and Olallie Lakes Trail, June 09, 2013. At just over two miles/3.22 km from the trailhead, Talapus Lake appears suddenly through the woodland fringe. Boot paths lead down to the heavily forested water’s edge. The lake’s source, Island Lake, pools just beyond the ridge above its far shore. Talapus Lake and Olallie Lakes Trail, June 22, 2013. Beyond Talapus Lake, the trail climbs to Olallie Lake through a pleasant wood of hemlock, fir, and redcedar. 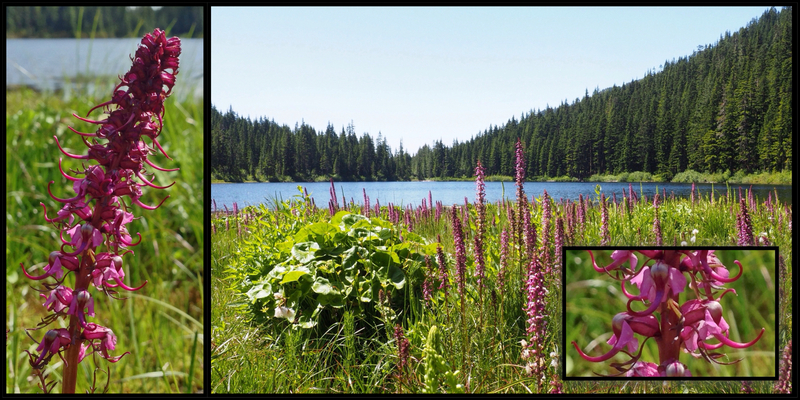 Talapus and Olallie Lakes Trail, June 22, 2014. Similar to Talapus Lake, Olallie Lake is densely wooded to its water’s edge. Where the main trail meets the lake, side trails lead right to secluded campsites and left to a boggy meadow. The western slopes of Tusk O’Granite Mountain and Granite Mountain rise beyond the lake’s far shore. With some imaginative license in spelling, Tusk O’Granite is named for its position between the Tuscohatchie lakes and Granite Mountain. 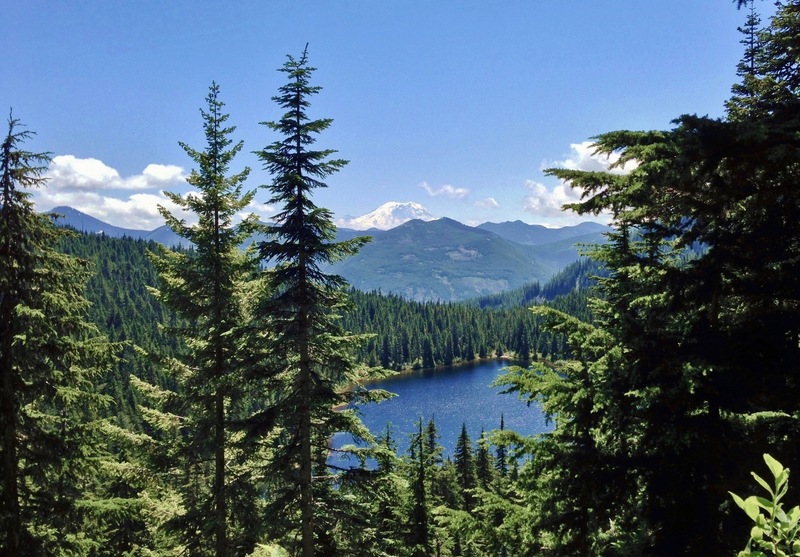 Talapus and Olallie Lakes Trail, June 22, 2014. 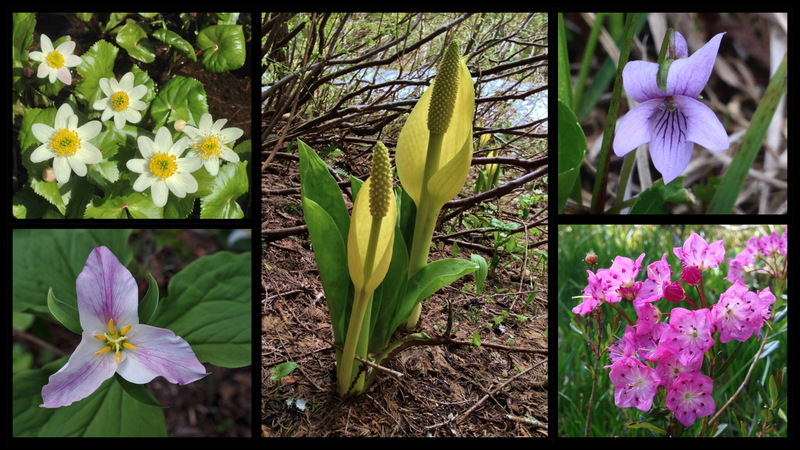 Along the lakes and trailside seeps, look for a variety of moisture-loving wildflowers, including white marsh marigolds (Caltha leptosepala) (upper left), Pacific trilliums (Trillium ovatum) (lower left), skunk cabbage (Lysichiton americanus) (center), marsh violets (Viola palustris) (upper right), and western bog laurel (Kalmia microphylla) (lower right). Talapus and Olallie Lakes Trail, June 09, 2013, May 30, 2016, and June 22, 2014. The star of Olallie Lake’s boggy northern shoreline is the elephanthead lousewort (Pedicularis groenlandica), which rears spikes of whimsically formed blooms like so many rows of rosy pachyderm-like faces. Elephantheads and their other lousewort kin are unfortunately named for the erroneous belief in former times that they caused lice infestations in livestock that grazed on them. Olallie Lake Trail, May 30, 2016 and July 01, 2017. 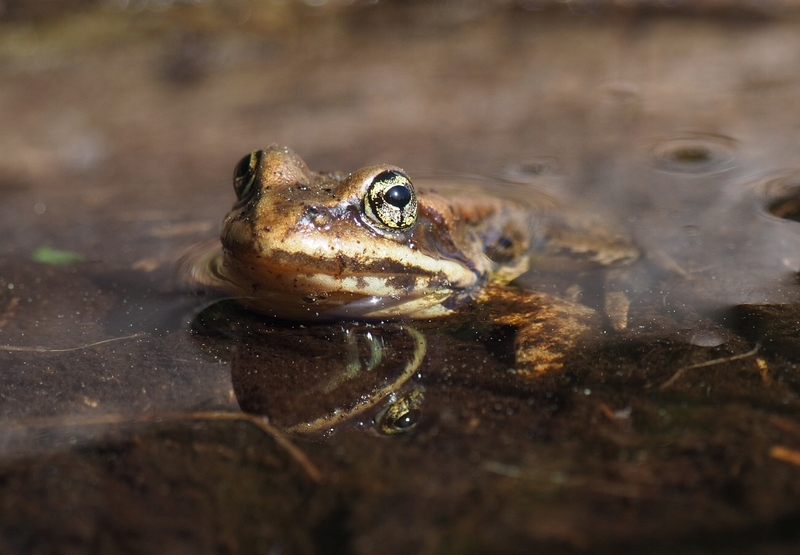 Frogs, here likely a Cascades frog (Rana cascadae), abound in the bogs that line Olallie Lake. Talapus and Olallie Lakes Trail, May 30, 2016. Approximately halfway between Talapus and Olallie lakes, a short side trail leads east by steppingstones across a creek to the Pratt Lake Trail. The side trail provides and alternate and slightly shorter route to Pratt Lake. Old-growth western redcedars (Thuja plicata) stand along the side trail, most heavily damaged by lightning but persisting nonetheless. July 01, 2017. About 0.25 mile/0.40 km left up the trail toward Pratt Lake and Island Lake, the forest opens to a view of Olallie Lake below and, on a clear day, to Mt. Rainier beyond. Pratt Lake Trail, July 04, 2013.